Collaborative Divorce Law Firm, Fraser Himes, P.A. Please ask us about Collaborative Divorce Law! It’s the best way to go for many. Mr. Himes is a past co-chair of Tampa’s most experienced collaborative law practice group — the Tampa Bay Academy of Collaborative Professionals (Mr. Himes was also a founder of “TBACP”) and is also a long-time member of Next Generation Divorce (“NGD” formerly the Collaborative Divorce Institute of Tampa Bay), another practice group of collaborative professionals. The Collaborative Divorce Model can reduce the expense and emotional hardship associated with traditional litigation. The end of a marriage or relationship through divorce or dissolution of marriage can be difficult enough. Often, the traditional process only adds to the pain. You and your spouse or partner may come to see each other as adversaries and the divorce as a battleground. You may experience feelings of confusion, anger, loss and conflict. Under such circumstances, you might find it difficult to see an end to divorce, much less imagine a hopeful future after the divorce is over. It doesn’t have to be this way. A growing number of divorcing couples are choosing this more cost effective, private way to end their relationship constructively rather than destructively. Professionals including divorce lawyers, mental health professionals, and financial specialists have been working with a more constructive alternative to the traditionally litigated divorce. These professionals have developed the Collaborative Law Practice model. An empowerment of the clients to choose the options that work best for them. Mutual respect is fundamental to the collaborative way. When respect is given and received, discussions are more productive and an agreement reached more easily. Please ask us for more information about the collaborative process. You may want to visit the website for the International Academy of Collaborative Professionals (www.collaborativepractice.com) for many informative articles. Also, please visit the websites of our distinguished local collaborative law groups of attorneys (Tampa Bay Academy of Collaborative Professionals) who are committed to assisting clients avail themselves of this more cost effective and emotionally sensitive approach of handling divorce NGD (www.nextgenerationdivorce.com). A key component of any successful litigation practice is the ability to help clients solve legal disputes efficiently. In every instance, Mr. Himes believes in allowing divorce clients to avoid the necessity of the courtroom when possible by resolving marital disputes before they develop into full-blown problems requiring judicial involvement. He also has extensive experience with the use of mediation in the dissolution of marriage process and has been a certified mediator himself. 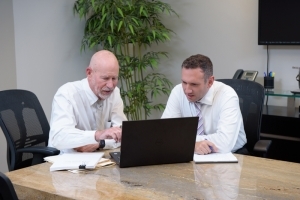 This experience, combined with his extensive trial experience, usually allows us to successfully resolve problems for our clients without a trial. If reasonable negotiations fail, and if the risks and the significant costs of traditional litigation are understood and agreed to, we can thoroughly prepare your case for trial and present it in the way best calculated to achieve for you what the law provides under the circumstances of your particular case.